The top of this ewer, with its stepped rim in three levels, resembles the cap worn by T’ang dynasty monks, from which this type of ewer derives its name. It has a pointed spout and a flat handle decorated with a “ju-i” motif at both ends, and is attached to the curvature of the belly at one end, and the rim at the other. The upper part of the handle has an extension that goes vertically up, ending at the same height as the rim. The vase has a straight neck, a rounded belly, and a ring foot. The lid, which is staggered in three levels, has a round knob. At one end of the lid is a small hole, and at the other it extends out to ensure a close fit with the spout. The vase is completely covered in a vibrant red glaze, the surface of which is pitted due to minute bubbles in the glaze in an effect known as “orange peel.” The glaze is thinner at the rim, foot, base of the rim, and along the edges of the handle, revealing a white border at these places. The inside and bottom of the base are white with a hint of green. The body itself is very thin throughout, and the original color is visible at the ring foot, showing it to be a delicate, pure white slightly speckled with iron spots. There is no reign mark, although the base is inscribed with a poem written by the Ch’ien-lung Emperor (r. 1736-1795) of the following Ch’ing dynasty, dating it to the reign of the Hsüan-te emperor of the Ming dynasty, and saying that it was kept in the Ta-ho (Great Harmony) Study. 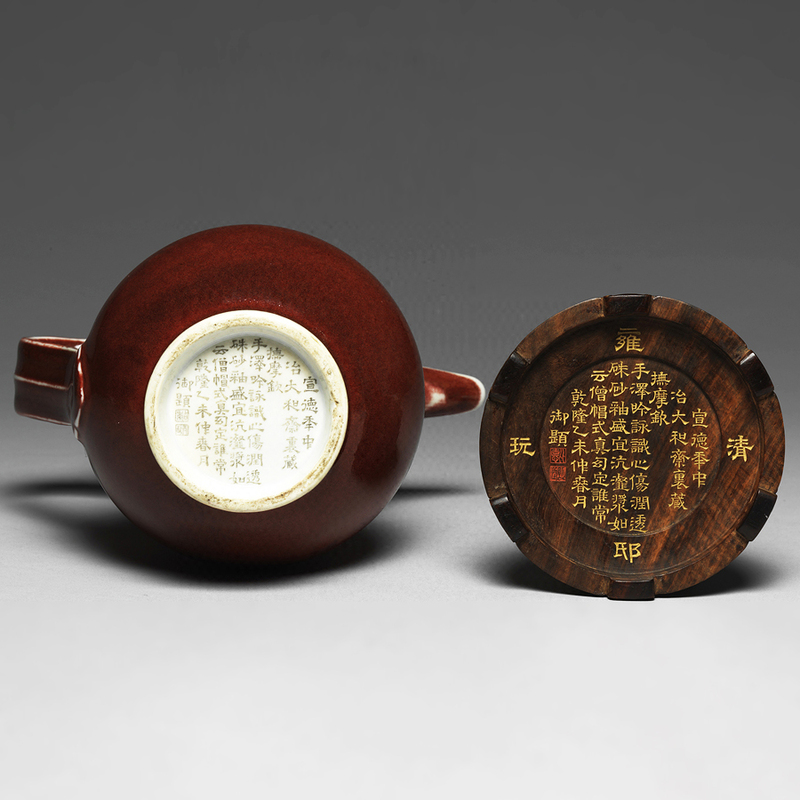 The poem, which is followed by two imperial colophon seals, goes on to extol the virtues of the vase. The stand is also inscribed with a seal to the effect that it was admired by the Yung-cheng Emperor (r. 1723-35): it is thus clear that this piece was a favorite of both the Yung-cheng and Ch’ien-lung emperors. 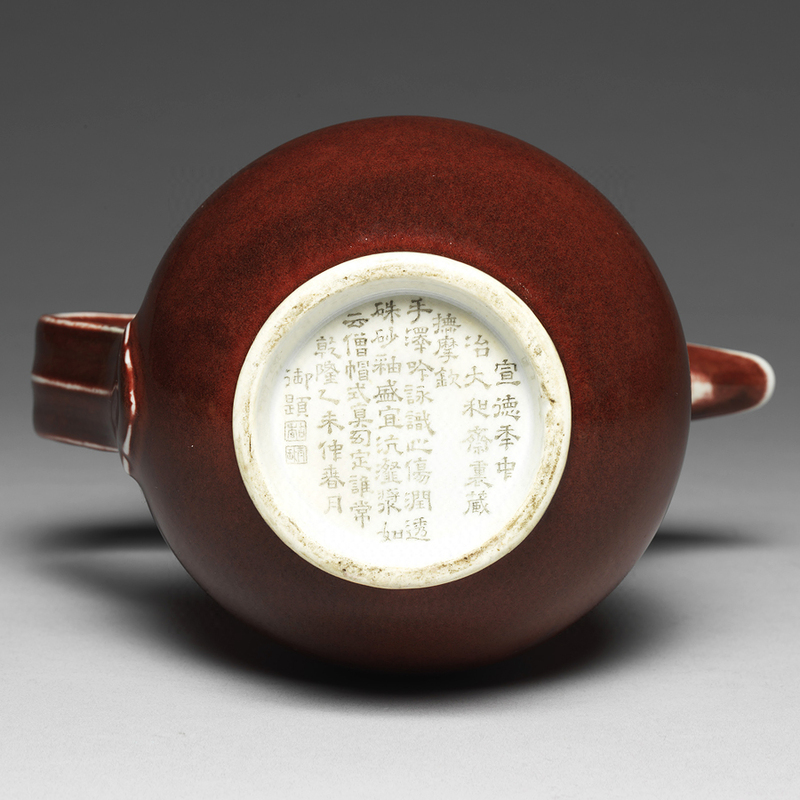 The ruby red glaze of the Hsüan-te reign enjoyed wide renown, and the white border at the rim, foot and other edges was a very popular feature accompanying this glaze. This particular vase was also much admired by the Ch’ing emperors’ concubines, and one of a series of four famous paintings depicting the concubines of the Yung-cheng Emperor by an anonymous Ch’ing artist, shows the red vase on a concubine’s dressing table alongside other bronzes and Ju official wares.